H K Shreedhar and Dr. Anandthirtha B Gudi . "Assessment of Degree of Severity of Parkinson's Disease using Gait Signal Envelope." Journal 4 Research 2.12 (2017): 1-6. Rohit Patidar and Mrs. Shivangini Morya. "Performance Analysis of QoS Parameters like PSNR, MAE & RMSE Used in Image Transmission Using Matlab." Journal 4 Research 2.12 (2017): 7-10. Prayag Parekh, Animesh Agrawal, Kshitij Sood and Girish Bagale. "A Review of Fully Automated Home Brewing Systems for Craft Beer." Journal 4 Research 2.12 (2017): 11-15. Ahmed Vaqhar Kazim. "Seismic Analysis of Irreguar (L-Shaped) RCC Building." Journal 4 Research 2.12 (2017): 16-18. Viddyut H. Khanvilkar, Chaitanya D. Patel and Nasim Shah. "Driver Drowsiness Alert System." Journal 4 Research 2.12 (2017): 19-21. JAY KUMAR SONI. "ROI Based Medical Image Compression with an Advanced approach SPIHT Coding Algorithm." Journal 4 Research 2.12 (2017): 22-26. Chirag J. Darji, Mrs.Ashwini Deshmukh, Manav J. Kotak, Vishal M. Maisheri and Prasad Prabhakar. "Analyzing the Impact of Interdependent Dimension on Target Attribute." 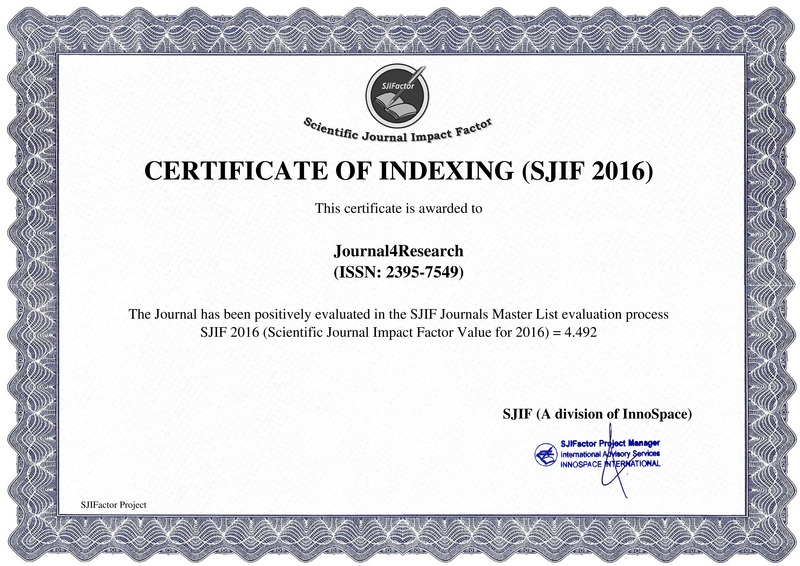 Journal 4 Research 2.12 (2017): 27-30. Meghna Chapaneria, Nisha Bhanushali, Krishani Mehta and Mansing Rathod. "Fingerprint based ATM System." Journal 4 Research 2.12 (2017): 31-34. JENISH G PATEL and Dr. Sanjay Vyas. "Performance of MVDC and MVAC Offshore Wind Farm Distribution System." Journal 4 Research 2.12 (2017): 35-38.